We believe that locally-owned, independent businesses are the backbone of our local economy and the foundation of Austin’s unique culture. 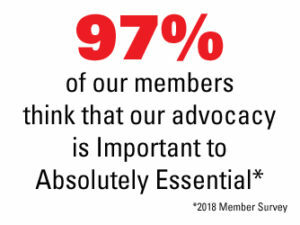 We believe in advocacy so much that we list it as one of the primary benefits of AIBA membership for local businesses. AIBA has worked tirelessly on behalf of our members and all local business to represent independent business at City Hall. From simplifying food handers certification to serving on the Imagine Austin Comprehensive Plan Task Force, local business now has a seat at the table. And that seat is an important one. If not for AIBA’s persistence in working on the comprehensive plan, there would be no mention of local business in our future at all. While we have worked on many issues large and small, none compare to the impact of the pdf Local Business Manifesto (2.78 MB) . When the AIBA was formed in 2002, the economic benefits of locally-owned businesses to local economies were suspected but unproven. In the years since, and with pioneering and nationally recognized leadership from the AIBA, the absolute correlation between local businesses and their positive impacts has been proven. In March 2010, the Mayor convened the first Small Local Business Summit with AIBA to explore the issues of local business in Austin. Since then, the AIBA has worked diligently with a round-table of local business owners to answer the next vital question­—How can the City of Austin stimulate local business ownership? The Local Business Manifesto attempts to answer that question. The Austin Independent Business Alliance represents more than 1,000 locally owned businesses. We are the voice of local business in Austin, Texas. Nowhere in our 16 year history has this voice spoken louder or more clearly than in the Local Business Manifesto. On Wednesday, April 4, 2012, AIBA held the Local Business Manifesto press conference at BookPeople. The press conference was followed by the passing of a pdf City Council Resolution (51 KB) to support the Manifesto and directing city staff to begin work on several items outlined in the Manifesto. The resolution was sponsored by council members Bill Spelman, Laura Morrison and Sheryl Cole. But the work has just begun. We continue to work with city staff and city council to implement the Manifesto. Did you know that AIBA has won an International Award for our IBIZ Districts? AIBA’s advocacy work continues through the goals selected in our Annual Local Business Conference. I support the AIBA because its representing the best interests of the local business community in Austin. As Austin continues to grow we need an organization that speaks to the importance of local businesses and the unique contribution that we make to keeping Austin one of the most attractive cities in the US. Rebecca and her team monitor the activities at City Hall and encourage our city leaders to consider how to best support the small businesses that are the backbone of the local economy.